Nature has been generous in endowing palm oil with a composition that is uniquely balanced between the saturated and unsaturated fatty acids. 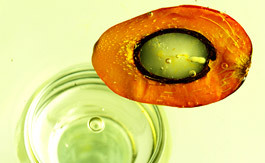 Even when programming this higher level of saturates in the oil, nature’s consideration for optimization was already apparent – the biology of the oil palm dictates that this saturate be in the form of palmitic acid (C16:0), the same saturated fatty acid that is most abundant in our body and throughout most of nature’s creations. As if further serious thought was given to this composition by nature, most of the palmitic acid in palm oil is placed within the triglyceride molecule on the Sn 1 and 3 positions. This is in stark contrast to palmitic acid from animal sources that is predominantly placed in the Sn 2 position. Within the modern concept of optimum nutrition, and in a food based environment that is reflected by highly processed foods, palm oil should have been rated higher by the nutrition gurus of this world. Unfortunately, the “fat-world” is overwhelmed by a predominance of how unhealthy saturated fats are and how these are implicated in a number of degenerative diseases, including Coronary Heart Disease (CHD). Dietary recommendations are thus numerous, with many authoritative recommendations targeting lower and lower levels of saturated fat intake even when it is obvious that such efforts would be futile since product functionality and consumer acceptance are often significantly compromised. The story behind palm oil is indeed a classical case study. Publications in the science and lay press were highly successful in convincing the often uninformed consumer that saturated fat consumption must be lowered to reduce increasing CHD risk. There was much merit in these concepts but the down side was the fact that the type of saturates was never differentiated from each other especially if they were of plant or animal origin. In the 1980s, palm oil as a food commodity oil began making significant inroads into the marketplace, often at the expense of soybean oil. The anti-palm, anti-tropical oil campaign that popped its ugly head in the mid-1980s created the scare tactics that resulted in the removal of palm oil from many food applications, especially those of solid fat formulations. The anti-palm oil campaign is now openly acknowledged as a commercial ploy by the competing oils against palm oil so that they could take advantage of the marketplace. The void left by palm oil was flooded by the use of partially hydrogenated oils and fats that were often touted to be far more heart healthy than the palm oil components that they so effectively replaced. This indeed signaled the rapid increase of trans fatty acids in our foods and recorded peak levels of consumption in North American and Europe during these periods. These trends were often fueled by health messages that sought to position polyunsaturated margarines and related fat formulations as the healthy alternative to saturated “tropical oils” despite higher content of trans fatty acids (TFA). The study of Mensink and Katan  suggested that trans increased total and low-density lipoprotein cholesterol (LDL-C) and decreased the beneficial high-density lipoprotein cholesterol (HDL-C) resulting in a less desirable TC/HDL-C ratio. Nearly a dozen other studies quickly fortified this finding, almost all reflecting increases in the atherogenic LDL-C and decreases in the beneficial HDL-C following the consumption of a TFA diet . Invariably it was established that TFA could be worse than the SFA they were designed to replace in the first instance [1,3]. The Nurses Health Study  elucidated the effects of TFA using epidemiological data from 85.095 women, establishing an association between TFA and incidence of non-fatal myocardial infarction from coronary heart disease (CHD). A positive and significant association between trans and CHD was apparent. Foods that were major sources of trans including margarine and cookies also revealed a positive correlation. Relative risk for CVD was increased by 27% as a result of trans consumption . These studies clearly established an association of TFA consumption with increased incidence and death from CVD and it was estimated that almost 80,000 deaths in the United States alone were associated with continued consumption of foods rich in TFA. Recent studies have implicated TFA not only with CHD  but also with increased risk and incidence of diabetes . Dietary fat intake was evaluated for CHD risk  and type II diabetes in women. A 2% increase in TFA consumption relative to carbohydrate intake resulted in a relative risk score of 1.93 for CHD and 1.39 for type II diabetes. In comparison the score for SFA was significantly lower: 1.17 for CHD and 0.97 for type II diabetes. These findings served to highlight additional concerns about the safety of TFA in humans. Other concerns include adverse effects of TFA on cardiac arrhythmia and underlying implications for the developing fetus since TFA competes with essential fatty acids during fetal development. Based on these findings and a review of all available published literature relating to TFA, the Institute of Medicine (IOM) of the National Academies of Sciences, USA  declared that there are no data available to indicate a health benefit from consuming TFA and an Adequate Intake, Estimated Average Requirement, and Recommended Dietary Allowance are not established for TFA. Resulting from this expert recommendation and the mounting evidence against TFA, the Food and Drug Administration (FDA) of the United States of America mandated that as of January 1, 2006, the Trans Fat Content in food must be labeled separately. There is currently an urgent race to reformulate many solid fats as TFA-free. The American Heart Association (AHA) in its Diet and Lifestyle Recommendations (Revised 2006), recommends intake of <7% of energy as saturates and allows only <1% as TFA. In the current US diet, the major sources of saturated fatty acids are animal fats (mostly meat and dairy) and the primary sources of TFA are partially hydrogenated fats. (The USDA says that soybean oil, is also a major contributor of saturates in the US diet, based simply on the quantities consumed). Although the AHA say that there are currently no numerical goals for TFA, the FDA recommends that TFA intake be less than 1%, and for this reason effectively forcing the AHA to recommend a similar dietary goal of <1% TFA. In the most simplistic interpretation of these facts and numbers, the AHA is finally acknowledging that 1% TFA in the diet is equated to 7% saturates in the diet for CHD risk! The FDA on the other hand only legislates the level of TFA in foods but not saturates, which by the way (saturates) still have physiological functions required for human related metabolic processes. The AHA has been a front-runner in the battle to educate the American consumer and reduce the significantly high rates of CHD related mortality within the American population. While the Europeans could boast of the Mediterranean diet and the French paradox as tools in their fight against CHD, the Americans had hardly anything to offer except their high fat intake, high TFA consumption and a over dependence on the fast food syndrome. To combat these anomalies, the AHA came up with an almost brilliant and strategized recommendation: reduce fat intake to no more than 30% daily energy and ensure that this recommended fat intake was balanced equally between the saturated, monounsaturated and polyunsaturated fatty acids in the ratio 1:1:1 (or 10% energy for each component fatty acid). Notice that this recommendation known as the AHA Step1 diet, made in the early 1990s, made no reference to hydrogenated fats or TFA. The Step-1 diet was a brilliant strategy but it soon became obvious that none of the 17 commercially available edible oils (including the much touted olive oil) on its own could fit this requirement. When palm oil was mentioned as part of this prescribed healthy alternative, it was simply snubbed at. In 1996 however, the itch to make palm oil fit into the AHA Step-1 diet was put to the test. Sundram et al demonstrated that up to 50% palm oil / olein when combined with liquid oils could provide the prescribed distribution of fatty acids without the burden of TFA. When the palm-based blend was evaluated in a randomized clinical trial, the surprising outcome was a significant increase in the beneficial HDL-cholesterol and a significant improvement in the LDL/HDL-cholesterol ratio following the consumption of the palm based AHA Step-1 diet. The results from the clinical study and other subsequent studies proved so intriguing that a series of health patents were successfully filed for and granted by the US patent office for increasing HDL-C and improving the cholesterol ratio. The patent claims were quickly brought to the market place through the innovative marketing efforts of Great Foods of America, Inc. (GFA) under the brand name of Smart BalanceR. This has currently become a household name throughout the USA, emerging as the most exciting health margarine and spread formulations in the US supermarkets, while boldly claiming “Patented To Improve the Cholesterol Ratio”. Sales of Smart Balance are currently on a upward trend propelled not only by its patented claim but also the fact that this product is probably the only genuine and original trans-free formulation made with unmodified natural oils and fat with a final objective of a balance fatty acid composition as recommended in the AHA Step-1 diet. The US food industry is possibly the most highly regulated entity within the global food industry and policed by the US Food and Drug Administration (FDA). Stringent regulations govern and safeguard the American consumer, ensuring a food supply that is of the highest quality. The FDA also safeguards the consumer against false or misleading health claims within the US food supply. In the very midst of such stringent safeguards, the patented claims of Smart Balance have been allowed after proper scrutiny of the facts engrained within the various US patents granted. What does this signal for palm oil as a potential replacement for hydrogenated fats? At the recent American Heart Association Trans Fat Conference (9-11 October 2006, Washington, DC) the consensus opinion was to reduce and eliminate TFA. However, this objective appears easier mandated that realized by the American food industry. One of the biggest stumbling blocks was the acceptance of what could be conceived as a healthy alternate to hydrogenated fats. The AHA made this more difficult by insisting that TFA containing foods when reformulated should target to reduce not only TFA but also the saturated fat content. They were not prepared to endorse direct TFA substitution but insisted that the TFA + Saturates content in the new product should be lower that the TFA content in the original product. Here is thus a potential conflict between what is recommended by the AHA as opposed to that which is legislated by the FDA with respect to TFA content in foods. If we take the Smart Balance concept as the preferred road towards trans elimination, this has two major advantages. Current efforts to find alternatives focus on using newer oilseed varieties that will yield oils which are higher in stearic acid to be used in solid fats; high oleic and reduced linolenic acid oils for frying applications. Well, these have their strengths and weaknesses but are also troubled by a lack of assured supply. Estimates from the seed producers themselves warn that it would be at least three years from the first commitment for seed purchases to the time the oil is made available to the end user (food manufacturer included). Does this mean that despite all the blaring alarm bells, the American industries are prepared to endanger the health of their consumers by continuing to not actively replace TFA while making excuses about possible solutions that are already at hand. A learned American scientist, Dr. Gary List, who is a well versed expert in this field, summed the situation precisely when at the AHA Trans Fat Conference he concluded that any solution targeting the trans fat issues must take into account the availability of the two most important oils on this planet: soybean oil and palm oil. Yes, a marriage of convenience is advocated and such a blended product containing palm and soybean oils already has a researched and patented record of health benefits. Yes, you guessed right: it is the Smart Balance range of products and which within the domain of the US food legislations is allowed to carry the patented health claim. The likes of the AHA are still paranoid by the possibility that palm oil would flood the American food system and increase overall saturation in the typical American diet. At current rates of consumption, palm oil accounts for less than 2% energy in the typical American diet. Under these circumstances, palm oil can be made accountable for less than 0.8% of the total saturated fat energy derived from the diet (based on total saturates of 40% in palm olein). Although such a minuscule contributor of the saturates, palm oil is continually being picked as the punching bag by less informed expert media writers. But this should not deter the single minded health planners who need hard facts. Despite (or is it because of?) a 50% palm oil content in a formulated AHA Step-1 diet, as explained above, the formulation resulted in a significant increase in the beneficial HDL-C and lower LDL/HDL-C ratio, both parameters known to potentially reduce risk for CHD. But the AHA is now arguing that Americans really need to target not the Step-1 diet but the Step-2 diet which advocates <7% energy from saturates. Many in the food industry already sigh in great pain since it has been shown to be rather difficult to achieve these targets and yet maintain product functionality and consumer acceptance. The lack of texture (resulting from a lack of solids) in margarine and bakery fats would basically result in “flat”, unappetizing bread for example. Consumers would then be tempted to rather risk health than taste and would be prepared to indulge in TFA containing hydrogenated products which have excellent product functionalities. This would be a major step backwards in current efforts against the CHD tide. We have made calculations and it is obvious that if it is the 7% energy from saturates that is the target, so be it. It is still possible to formulate a Step-2 diet that partners soybean oil with palm oil and this concept is again engrained in the original patents that led to the successful development of the Smart Balance range of products. Again, resulting from the reformulation, the patented health claims would continue to apply within the current food legislations policed by the FDA. The bottom line is that if America is serious about eliminating TFA, it must look into a marriage between soybean and palm oil. Of course, palm oil can continue to be the minor partner in this and yet deliver the quality and functionality that is so crucial to make the consumer turn away from hydrogenated fats. After all, we had always called palm oil the darling of the food industry for its versatility; now there is evidence that this functionality, versatility and consumer acceptance can be marked with good nutrition as well. What then, is holding you back?